Check out the free walkthrough for Dark Tales: Edgar Allan Poe's The Premature Burial on our blog! 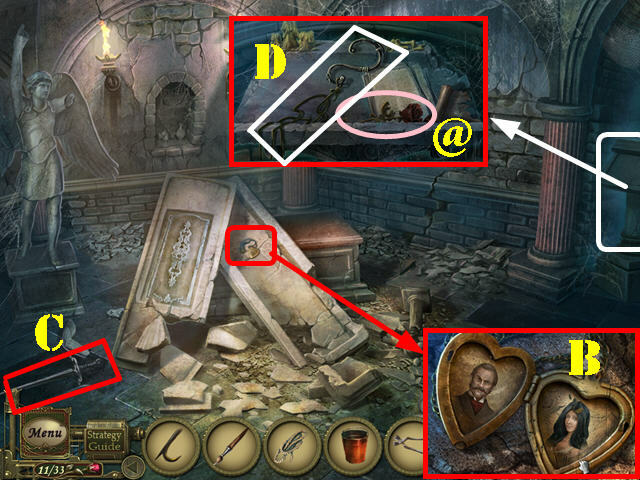 Re:Walkthrough for Dark Tales: Edgar Allan Poe's The Premature Burial available! The walkthrough does show where the BRUSH is, but it can be easy to miss. Examine the portrait; take the ROSE (@) and the BRUSH (G). how do i sharpen the sword to cut through the overgrown ivy. can't get the brooch puzzle to work. I moved the squares around and the brooch doesn't seem to move. Then came and looked at walkthrough but clicking on the brooch doesn't produce any arrows. I tried moving all the block to all sides of it (and empty space) to try and get the brooch to move. I get the premise of the puzzle just can't get it to work? edit - why does this always happen, you spend ages on something then completely exit the game come here to find out what's wrong then try again and it works! The brooch didn't slide with me at all - the whole block. I eventually got it to but it was sticky and slow. I checked the walkthrough and I don't see it anywhere. Please respond because I won't be able to finish if I can't find it. Thanks in advance!!!!! Just now found the SWORD !! Thanks anyway. Nice walkthrough. Can you advise where I can find the cheese for the mouse trap? Thanx. Hey, I cant find the rope to repair the tool on the bench. Looked through the walkthrough but cant seem to find it. Help! I finished the game with 32 out of the 33 roses so I went back for the last one. Now what do I do with the bouquet? I have the collector's edition & it won't let me use the bonus extras. I can't find the happy couple. I guess they eloped. I think you find the sword for the statue in the crypt basement. It's in the lower left, below the statue of the angel with the broken arm.